Capping is one of several methods used to protect people and the environment from contaminated materials found in the soil. The method covers the polluted area with either concrete, asphalt, clay or a geomembrane material to prevent the migration (movement) of pollutants away from the contamination site. Migration can occur by rainwater moving through the soil, surface water moving over the ground or by the wind blowing across the site. 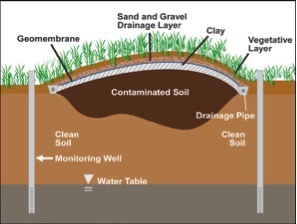 Prevent the vertical movement of water through the contaminated soil. Create efficient drainage of surface water from the site to prevent the collection of standing water. Resist damage caused by the settling, consolidation of the soil or other adverse conditions such as heat, cold, UV radiation, etc. Funnels away as much water as the underlying filter or soils are capable of handling. Capping is an attractive alternative when excavation or treatment is not cost-effective or protective of human health and the environment. Capping is often required when contaminated soils and materials are left in place. How Long Does It Take To Construct a Soil Cap? Depending how large the contaminated area, cap construction can take just a few weeks or several months using standard road construction equipment. A Citizen’s Guide to Capping, EPA, (http://clu-in.org/download/Citizens/a_citizens_guide_to_capping.pdf) retrieved October 16, 2014. Common Cleanup Methods at Superfund Sites, U. S. Environmental Protection Agency, June 1992.